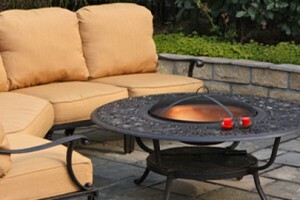 Spring is getting closer, which means that you get to spend more and more time on your outdoor area. While the weather might be a bit unpredictable at times, we are coming towards more daylight hours. This means that you can comfortably spend more time on your patio than you would during the winter. 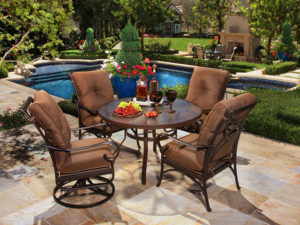 How are you going to find the right patio furniture to make sure that you look forward to those days even more? March and April are great months to be outdoors – you have the right temperature where you don’t feel too hot and you get a chance to work on your backyard before hot summer begins to set in. This is the time to get some of those more delicate plants. However, where are you going to store everything that you need to work in the yard? Where are you going to store your tools? Sure you can leave them laying on the ground, but if you want a chic, convenient solution, an outdoor storage box is the right idea. These outdoor storage boxes come in steel and wood and are going to protect everything you use in your yard. That way, you don’t have to worry about the elements and have your outdoor area be even more organized. Why slave over a hot kitchen indoors when you can enjoy the beautiful weather in the early springtime? Outdoor grilling is something that most people really enjoy and a great way to spend your weekend. Even though some people are going to argue that grilling season doesn’t really start until the summer, we believe that you shouldn’t have to wait until those red-hot nights in June and July before you can start getting re-acquainted with the finer barbecue recipes. With the days getting longer, wicker sofas are perfect for spending more times outdoors. These give you a space to stretch out, making your patio into a pleasant lounging space instead of just a place to be for a few hours. 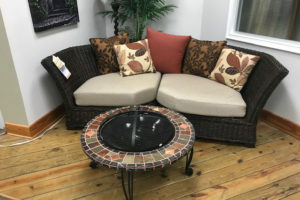 Because wicker is lightweight material, you can always move the furniture around or rearrange quickly. Is the sun slowly turning, meaning that you have some more shade in one area? You can easily move your wicker furniture around. This amount of flexibility makes your patio a great place to be at all times. Fortunately, we have a wide range of options for all those patio-related suggestions. Look through our options on the website or come down to the showroom and see it for yourself.